Establishes a new Center for Vehicle Electronics and Emerging Technologies within NHTSA to strengthen the agency’s expertise in new technologies across all vehicle safety components. Requires new safety standards related to electronics and unintended acceleration, including: a brake-override standard; a standard that prevents pedals from getting trapped in floor mats or other obstructions; and a standard for electronic systems performance. Requires that all vehicles be equipped with event data recorders that record crash information. Increases the civil penalty NHTSA can seek per violation and eliminates the maximum civil penalty allowed. Requires more “Early Warning Reporting” data submitted to NHTSA on a quarterly basis be made available to the public, improves public accessibility of the NHTSA website, and encourages consumers to report potential defects to the agency. Requires that a manufacturer have a senior executive in the United States certify the accuracy of information submitted to NHTSA in response to investigations. Enables a citizen whose petition to NHTSA requesting a defect investigation has been rejected by the agency to challenge that decision in court. Establishes a vehicle safety user fee paid by the vehicle manufacturer for each vehicle certified to meet the federal motor vehicle safety standards for sale in the United States. This fee, which would supplement appropriations, would support NHTSA’s vehicle safety programs. In addition, the legislation doubles the authorization for NHTSA’s vehicle safety programs over three years. The bill has been referred to the Senate Committee on Commerce, Science and Transportation. Notify pedestrians that automobile is approaching. - System works automatically from 0 to 20 km/h. - It is not needed when internal combustion engine is running. - It is not needed when backup alarm is operating. - Temporary OFF switch may be installed but telltale is needed. - Default position is ON. - Switch is visible to driver. (1) Sound shall suggest automobile driving condition and shall be continuous. Following sounds are inappropriate. - Any other sounds that can not suggest automobile. (2) Produced sound shall change volume and interval/step in accordance with driving speed so that pedestrian can detect easily. 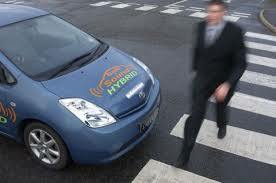 (3) Sound volume shall not exceed a level in which ICE vehicle is running at 20km/h. On April 22, 2009, Senators Kerry (D-MA) and Specter (R-PA) introduced a bill, S. 841, intended to protect the blind and other pedestrians from injury or death as a result of silent vehicle technology. The Pedestrian Safety Enhancement Act of 2009 requires the Secretary of Transportation to conduct a study on how to protect the blind and others from being injured or killed by vehicles using hybrid, electric, and other silent engine technologies. The bill was referred to the Senate Committee on Commerce, Science, and Transportation. Representative Stearns (R-FL) has introduced legislation (H.R. 1257) to require the disclosure of information relating to the fair market value and safety of damaged motor vehicles. The bill would require NHTSA to issue a regulation within 270 days of enactment requiring all persons who terminate a contract related to a motor vehicle due to flood or water damage, collision, fire damage, theft and recovery, or any other circumstance that adversely affects the fair market value of the vehicle, to disclose to the public in a commercially reasonable, electronically accessible manner information related to the vehicle and the reason for the contract termination. The bill has been referred to the Committee on Energy and Commerce. On April 9, 2008, Representatives Towns and Stearns introduced the Pedestrian Safety Enhancement Act of 2008. The legislation (H.R. 5734) mandates a rulemaking to “establish a method for alerting blind and other pedestrians of the presence and operation of nearby motor vehicles.” Per the proposed legislation, the rulemaking process would begin 90 days following publication of a study that is to be completed within two years of enactment. The study is to focus on identifying: 1) “practical means” of alerting at risk individuals to the presence of quiet running vehicles; 2) minimum sound levels; and 3) other methods to convey “information essential for pedestrian safety.” The legislation call for a final rule to be issued no later than 2 years after publication of the NPRM. The bill has been referred to the Committee on Commerce and Energy.